Raj Tents were proud to support the 2010 Women’s Conference in Long beach for the third year running. The monumental event, also known as ‘the conference with a conscience', was sold out in July in barely 15 minutes and was titled ‘It’s Time’. The aim is to inspire people from all walks of life to see this challenging moment in history as an opportunity to come together and transform not only themselves, but their communities as well. The conference was hosted by CA First Lady Maria Shriver and Governor Arnold Schwarzenegger, First Lady Michelle Obama, Second Lady Jill Biden, Former First Lady Laura Bush, Mary J. Blige, Jerry Brown, Justice Ruth Bader Ginsburg, Matt Lauer, The Honorable Sandra Day O’Connor, Mary Oliver, Suze Orman, Dr. Mehmet Oz, Robert Redford, Al Roker, Diane Sawyer, Jessica Simpson, Meg Whitman and Oprah Winfrey. Raj Tents provided the ‘Sanctuary Tent’ for Pier Paolo and Studio Maui to create a sacred corner inside the conference to offer a physical and symbolic quiet space for yoga, meditation, chanting and aromatherapy. The tent was cream and pink and lit with crystal chandeliers with an area outside set out with Raj Tents low furniture upholstered in matching pink silk brocade. Transformation through tranquility works better in the right setting, and the gentle colors and lush fabrics worked a treat. 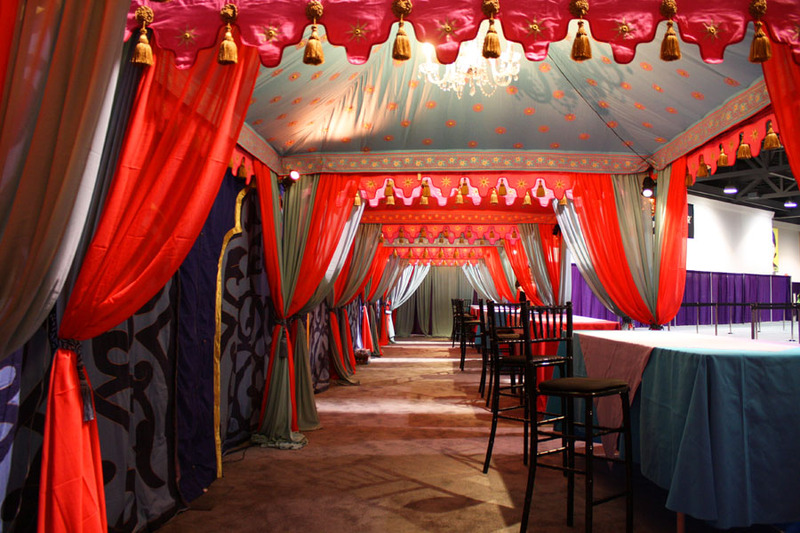 For the book signing area, Raj Tents set up a line of alternating pink and turquoise Pergolas with hot pink scalloping, lit with crystal chandeliers and jeweled corner lamps. Authors who signed their books under the Pergolas included; CA First Lady Maria Shriver, Deepak Chopra, Billie Jean King, Former First Lady Laura Bush and Jane Fonda. In the Village area, Raj Tents set up the focal point Pavilion in spicy orange that acted as a beacon across the crowded convention center floor. Hundreds of thousands of women who were unable to attend in person attended the conference via its live webcast around the world via various ‘Satellite Summits’, increasing the range and impact of the profoundly inspiring message of commitment to a more integrated future championed by women, benefiting all.